Photo by JW McNay/The Collegian Monica Munoz Martinez, Brown University American and ethnic studies assistant professor, responds to attendees during a Q&A session. Martinez spoke at The Injustice Never Leaves You Oct. 17 on TR Campus. 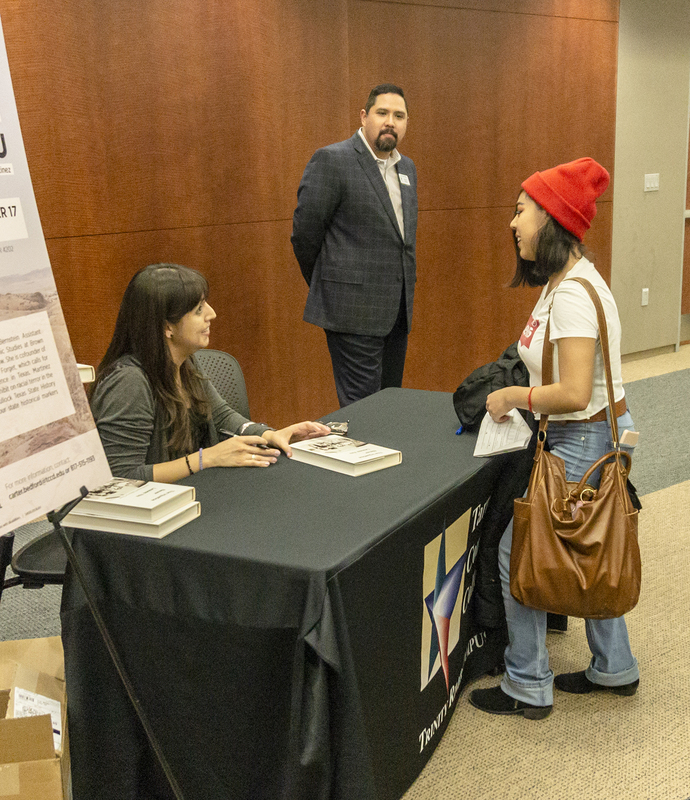 A guest speaker presented what she called a lesser-known history of Texas-Mexico border relations 100 years ago and the parallels that can still be drawn from that time today. 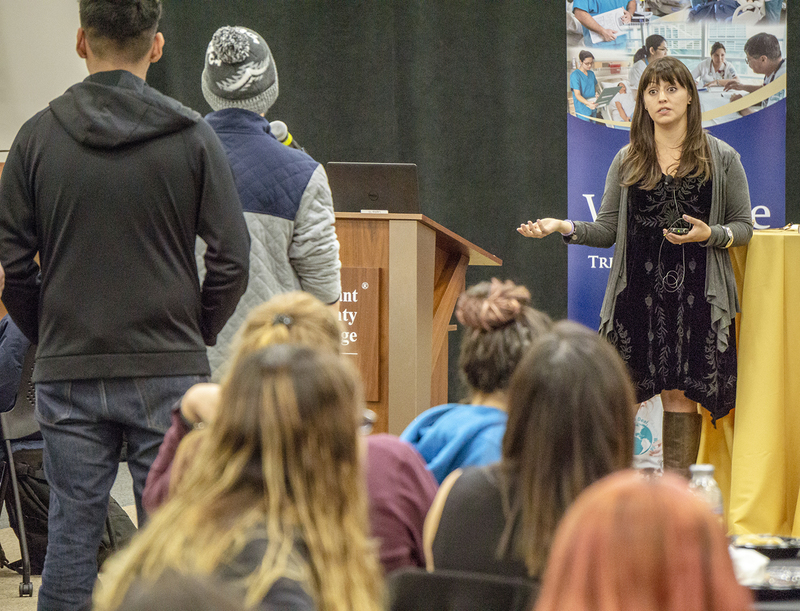 Monica Munoz Martinez, Brown University American and ethnic studies assistant professor, spoke to students, faculty and community Oct. 17 on TR Campus about her book The Injustice Never Leaves You: Anti-Mexican Violence in Texas. Martinez is interested in the relationship between history, memory and power as well as how history is remembered. “I think about what it is: The relationship between mainstream histories, the histories that we see in museums and that we see in public school lesson plans, and how that’s different from the histories that people who are members of racial and ethnic minorities learn at home,” she said. From 1848 to 1928, mob violence against ethnic Mexicans has “largely been forgotten in public memory,” Martinez said, adding that “ethnic Mexican” refers to U.S. citizens racialized as Mexican and Mexican nationals living in the U.S. in this era. And racial violence against ethnic Mexicans in Texas at the hands of law enforcement also rose between 1910 and 1920, she said. “This decade itself was a particularly brutal period when ethnic Mexicans were criminalized and harshly policed by an intersecting regime of vigilantes, state police, … local police and U.S. Army soldiers,” she said. TR student Cindy Tovar gets her book signed by guest speaker Monica Munoz Martinez. Tovar was one of 20 attendees to receive a free copy. Surviving families and friends of these victims were “unsettled with the injustices they were left with,” she said. A lack of due process in these times failed to get justice for victims of racial violence and their families. “I’m committed to finding ways to research [and] recover these histories but also to make them public,” Martinez said. She highlighted different cases in the presentation including a double murder of the grandfather and great-grandfather of Norma Longoria Rodriguez. Rodriguez learned about it as an adult and spent decades trying to document it, but there are no records of the deaths or an investigation, Martinez said. However, Rodriguez did have the land deeds for them as well as a teaching certificate for one who was also an elected official. In the post-speech Q&A, TR student and student government organization vice president Dakota Flores asked Martinez how students can help publicize this history and if more ethnic studies classes would help. Flores is biracial but doesn’t really feel connected with his Hispanic heritage. However, the presentation and its visuals affected him, he said. “Sitting and listening to the stories and then looking of the faces of the people that are more connected to that just made me more emotional just thinking about it,” he said. Martinez hopes making this history more public will also provide a reminder to the harms of criminalizing racial or ethnic groups and denying them due process.